The story begins with an accusation that I am on the way to becoming a vegetarian. So I like my vegetables, but no offence to those amongst us who have decided not to kill and ingest animal matter, but to me, the two must coexist. Hence I was led to begin a quest for the greatest vego-unfriendly place, and where better to begin than from steakhouses, where flesh and blood reign, and hopefully where a good glass of red wouldn't be far off. The chance came to try it out when we were to celebrate a birthday amongst some meat-loving friends. Hardly costing any more than the TGI Friday suggestion, I practically leaped at the opportunity to book a table at Lazar, and a spot on leap it was. The menu consists of not much more than (surprise, surprise!) beef. Mains are definitely the highlight here, so feel free to lay low on the entrees, though there’s a rich beef broth, beef cevapcici, as well as fiery pork sausages for those in need of a little departure from the red stuff. Then, to the lead acts: choose from rump, scotch fillet, porterhouse (sirloin), and eye fillet, all aged on the bone in a cool room on this very premises and chargrilled to your liking. The result is steak that is fibrous yet tender, and so juicy that you’d think they'd injected liquid into it. As I was chewing through the wonderfully crisp and flavoursome charred exterior, the rich juices filled my mouth like no steak had ever before. It was impossible to imagine that each small morsel could contain so many juices, especially after such intense grilling that lends the outside to become almost blackened. The steak is cooked to perfection with almost scientific accuracy. A medium, for example, remains red inside, but juices no longer flow out of it. This is also helped by the resting of the meat, letting the fibres to relax after cooking, hence allowing maximal fluid retention. The observant among us may realise that the places are not set with steak knives, and neither will they bring you any, not because they’re mean, but because you simply won’t need one. Their steaks almost magically divide into bitesized portions upon application of minimal effort with your ever so average looking knife. Note to competing steakhouses: buy high-quality grass-fed beef, age your steaks well, and you’ll save on buying expensive steak knives. Unlike beef such as wagyu that relies on heavy marbling of fat for its suppleness, the tenderness of the steaks at Lazar is from the ageing and the sheer superiority of the produce. Using good ol’ Australian beef means that we are assured of the bold flavours and aromas of this delightful meat. For the uncompromising vegetarian in me, I was relieved to find that all steaks are served with a simple and agreeable potato, lettuce and tomato salad. The wine list has a reasonable range and labels, but we were slightly worried by the fact that no vintages are mentioned. While this is probably an indication that the same vintages are always offered, we weren’t too bothered as we’d brought along our own. However if you’re bringing an extra special bottle, the miniature stemware may disappoint. Desserts were never meant to be a steakhouse’s forte, and Lazar doesn’t stray from the mainstream in this respect. Apart from scoops of ice cream, there are crepes with huge strawberries, ice cream and cream that can easily be shared between two, as well as simple lemon and sugar ones. Not quite as 'orgasmic' as suggested by the witty and conversational waiter, but nonetheless homely and satisfying in its predictability. Nothing ever changes at Lazar – the bricks, the wooden panels and mirrors, the bow-tied waiters, the menu – it can hardly be called an ‘it’ place. But if it ain’t broke (and oh no, it ain’t! ), why fix it? It would be hard to imagine anyone who finds doing household chores genuinely pleasurable, but if I had to choose one I’d rather do, my first choice by far would be food shopping, not the supermarket kind though, mind you. Limp veggies under fluorescent lights, factory salami, and apples that taste like cardboard have never really been my thing. I always volunteer to do this chore, pretending that it’s just as painful as vacuuming, while snickering discreetly as I drive out to the Queen Victoria Market, which is my best bet for crisp green beans, fresh salad leaves, honey scented apples, as well as polish sausages, and an infinite variety of cheeses. As if I need any more motivation to come here, there are places to stop by for a coffee and a lunch too, like the famous Bratwurst shop in the Deli section (hotdog-type rolls with the aforementioned German sausage; if you don’t know where it is, just look for the longest line in the Section), or the humble Coffea on the Elizabeth Street side of the market. Given its market presence and its name, the fact that Coffea is a coffee merchant as well as a café should be of little surprise. Coffee fanatics will love the brewing accessories for sale on one side if the shop, unless they’d been momentarily transfixed by the commercial roaster at work right in the middle of the room. With equipment and a name like theirs, they would be terribly wrong to dare offer mediocre coffee – and luckily, they couldn’t be more on target. Perfect is not a word I use lightly, but the coffees here are just that. Not too strong yet superbly aromatic and never, I mean never, bitter. Most mornings Coffea is bustling with CBD workers and perhaps early market-goers, who, either grabbing a takeaway pastry or enjoying a sit-down breakfast, are all here for a stellar coffee. While sitting inside seemed the obvious choice for me in this weather, at lunchtime, hoards of hungry souls filled the many pavement seats, staying toasty under the outdoor heaters. Lunch here is a ham and cheese affair. Well, except your “ham” could be prosciutto, pancetta or shaved leg ham, and your “cheese” could be parmesan or provolone – no plastic cheese here, thank you very much. Usually some salad greens like garden-fresh baby spinach or rocket are thrown in too, as well as relishes and sauces. A grilled vegetable ciabatta included artichokes, an interesting choice as a sandwich ingredient, as are salad-like combinations such as green beans and tuna. There are real salads too, as well as soup for those in need of a winter warmer. My mushroom paté, prosciutto and parmesan ciabatta came toasted and on a warmed plate. Brownie points for attention to detail. The paté was more like a dense mushroom purée, its fragrance resonating in my mouth long after my final bite, rivaling the intensity of a madly expensive truffle purée I bought recently from a French farmer in London. The flavour of this truffle purée is tremendously rich, but hardly overpowering, satisfying one’s oral cavity like flowers blossoming all at once, filling a meadow on a spring morning. This mushroom paté is less exhilarating, but nevertheless an elating employment of this much more modest fungus. The prosciutto and parmesan on their own are excellent ingredients. The prosciutto was moist and stretchy with that lovely cured flavour, while the parmesan was creamily rich and just pungent enough. The two together though, was less successful, becoming a bit too salty, even with the thick bread around it. 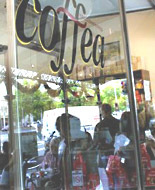 Non-coffee drinkers need not fret, as Coffea also offers a range of other beverages, such as chai, hot chocolate, and Italian bottled soft drinks. You never know, with a visit to Coffea as a reward for doing chores, you might even see me polishing my roof soon. I'd always had a belief that bad food can be made to taste good by adding more fat. Deep-fry a less-than-fresh piece of fish slapped in thick batter, and most people would happily munch away at it. Put enough butter and cream into your mashed potatoes and you¡¯d be called a master chef. But by no means am I suggesting that fats are nothing but evil ¨C quite the contrary. The famous Shanghainese "lion's head" meatball would be horribly tough and dry if only lean pork was used. It needs the moisture and lubricating qualities of evenly dispersed fat in the mince. Or so I thought. My argument was quickly rebutted with a comment that the best ¡®lion¡¯s head¡¯ with the same (or even better) texture and flavour is made by mixing lean pork with tofu. Most people are well-acquainted with these bricks of soybean derivatives, be they silky white or golden-skinned and earthily dense. 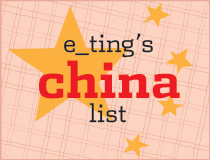 They are now an essential part of vegetarian cuisine, of the east, west, and beyond, and culinary creativity with the humble ingredient has yet to see its limits. Some people swear by it, others loathe it, and I personally think that those in the latter category should be sent into mandatory tastebud training. If there was a qualified centre for this, it would undoubtedly be the Tofu Shop International on Bridge Road. Here, soybeans are used for almost everything, from sweet slices to felafels, and even ¡®soyvlakis¡¯ (instant points for linguistic creativity). The soy felafel is brilliantly flavoursome and the addition of walnuts makes it all the more exciting as you crunch through the generous heap of salad inside the pita bread lined with all their sauces and condiments (tofu dip, peanut satay sauce, yogurt, chilli, Japanese pickled ginger). It looks deceptively tame as you sit at the stools in front of the glass counter watching the amiable staff assemble it before you, but it transforms into a bit of a roller-coaster ride in your mouth, with the vegetables and the nuts trying to outdo each other on the vertical crunch scale and the sauces and felafel making your tongue spin laterally, adding up to create a breathtaking ride. The main offering at this cozy shop is, however, the array of dishes that one can pick and choose from to construct hearty lunches in bowls of three sizes ¨C small, medium and large. All are vegetarian and you can pick as many different dishes as you like ¨C staff will adjust proportions accordingly or as you request. We chose a medium bowl and tried four dishes. The curried parsnip with tofu was pleasantly spiced, and went well with the natural sweetness brought out of the parsnip. The coconut sauce penetrated well into the layers of the halved Brussels sprouts, and was an interesting and successful combination with the chunks sweet potato and cauliflower florets. The broccoli with vinegared lettuce and sliced mushrooms was superbly done, with all flavours and textures working in perfect harmony. Everything was cooked to perfection ¨C the broccoli soft enough to be easily bitten into yet retaining its fresh green colour, the parsnip preserving a hint of tangy heat, the sweet potato, cauliflower and brussels sprouts all just right, despite differing requirements in cooking times, and the pumpkin roasted so tenderly that I forgot about removing the skin. The bowls are offered with a small amount of rice, which does a good job of absorbing the lovely juices and sauces. Sweet things forever catch my eye, and here, in the glass cabinet, they may be in the form of an innovative Chinese red date and coconut slice, or an impossibly stone-fruity peach and tofu slice. The tofu gives it a surprisingly smooth and creamy quality, but cleverly stays away from the overwhelming density that slices tend towards. No matter where you sit, you will undoubtedly see some interesting merchandise for sale ¨C I saw a hangover cure behind the counter, as well as a good range of teas (including chai) on the shelves that line the walls on one side of the shop. We've stuffed our faces with great food, yet we leave feeling refreshed and satisfied, detoxified, almost. Big brand theme parks can be fun sometimes, but your trusty, local, down-to-earth amusements are often more delightful (on your hip pocket too). [edit - 20 June 2011]: sometimes I wonder why I wrote sh*t like this. Pellegrini's coffee is horrible, and the pasta, well, it's "nostalgic" yes, like macaroni in soup in Hong Kong is - it's not exactly the pinnacle of pasta dishes... Anyway, that's what a blog is for isn't it, so you can reminisce and cringe. Mother's day has come and gone, and as with the past four or five years, I've spent it without the day's protagonist, my mother. It's at times like these that I miss her most, her cooking in particular (a skill she now rarely displays as she has long since transferred it to our maid in Hong Kong, but that's another story), with that snuggly warmth that even the best restaurants could not reproduce. Luckily, I've found an adoptive mother in Melbourne. She's Italian and she makes me hearty meals whenever I pay her a visit in her little corner bar at the top of Bourke Street in the City. For all I know, my "mamma" at Pellegrini's could be a twenty-five year-old male chef working in the kitchen out the back, but when the plates of pasta are dished out, I can't help but imagine that they are the creations of a middle-aged lady in a paisley apron who sings sweetly as she stirs the garden-fresh napolitana sauce into my perfectly al dente penne. The dish looks, smells, and tastes wholesome, thanks to the finely chopped celery, julienned carrots and melting globules of tomato that act as the base of this clean, minestrone-like sauce. It¡¯s not cloying in the least, and strikes just the right balance of acid and salt with the fresh sweetness of the vegetables. Simple yet satisfying. The dish is plenty for one, and could probably be shared between two if you weren't too hungry, and a lot of the time I intend to do so. But for some bizarre reason, as soon as the Papa-esque gentleman serves me my plate with a "Grazie, Bella", my arms wrap around the warm plate like a fortress on the wooden bar table as I hiss "Mine! Mine!" like a five year-old. The same happens when I order the risotto primavera, a non-creamy rendition of this rice dish that uses long grain rice. Again, it is moistened by a light, tomato-based broth dotted with peas, carrots and other vegetables. It is yet another formidable dish. The use of cream is negligible in these dishes, if any was used at all. Its addition would only have undermined the natural balance of flavours in the sauces. The menu of mains is brief, and all the available dishes are listed on one side of the wooden noticeboard stretching across the middle of the narrow seating space. It will have several pasta basics such as lasagna, gnocchi, ravioli and spaghetti bolognaise along with other interesting dishes such as mozzarella bolognaise, which by my translation, seemed to mean just cheese and sauce. As it turns out, it is actually a thick slice of bread smothered in a rich bolognaise sauce, something that even the pickiest of my dining companions was pleased with. If you were generous enough to share your main meal, you may have space left for some tiramisu or other sweets beckoning to be devoured, on display at the lower end of the bar. If not, one of Melbourne's best coffees, or their super-sour lemon granita, awaits. The dining space essentially consists of two lines of bar stools, as well as a communal dining table at the back. Despite the extremely narrow space, the bar stools are surprising comfortable and I personally have spent many an afternoon (and evening) sitting facing the mirrored wall, chit-chatting away while relishing a delightful pasta, with intermittent strikes of fear that Mamma will come out to tell me off for speaking with my mouth full. Instead, after I recite my meal (so they can work out my bill), the waiter behind the bar makes me blush and giggle as they give me my change, along with a wink and a mischievous "Ciao Bella!" 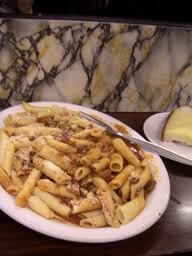 Though I have no childhood memories of growing up in an Italian village, Pellegrini's food is nostalgic. And at their friendly prices, you can feel free to visit Mamma whenever you need a bit of homely warmth. A lot of the time we try to avoid nice restaurants because they just seem too expensive, but with the bar option at restaurants like Pearl on Church Street, you can have a Glam Night Out without getting a Big Cash Out. From its inception, Pearl has always been on the top of many foodies' lists. Chef Geoff Lindsay is known for his adventurous Asian-inspired food that has led Pearl to win numerous awards. However, the familiar fine-dining price range at the restaurant probably means that visits there should be left for special occasions. The bar, on the other hand, is much more budget-friendly, and gives a sneak peek of the restaurant offerings as well as serving some more classic dishes. The bar is no longer just for drinks. What about those soggy chips and overdue nuts? No can do! 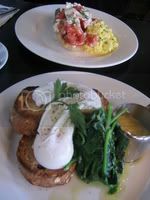 We visited at lunchtime, initially hoping to catch some of their much-raved-about weekend brunch, but having been spoilt by the all-day breakfast cafes around town, we forgot that at 12.30, people should really be having lunch. The friendly waiters smiled forgivingly at our ignorance and handed us lunch menus and the wine list. Wines by the glass are listed on the first page, followed by many pages of wines by the bottle categorized by type and style. I decide it's too early for alcohol and my companion was really my chauffeur so we give the wines a miss. The lunch menu is a much briefer document, with "little", "bigger" and "sweet" dishes on the one page. "little" dishes such as prosciutto with grissini and olives, lamb and fennel seed sausages, and lettuce cups with rare beef salad are perfect as nibbles to share. We choose the flat chips with dips and the fried eggplant with ponzu sauce. The "flat chips" turn out to be impossibly thin homemade potato chips served with a flavour-packed tomato relish and a creamy, mayonnaise-like sauce. Scooping up the chunky relish with a chip is as close to impossible as for me to stop eating chocolate, due to their airy thinness, so restrict all dipping action to the other sauce or you抣l find yourself with unsightly chip crumbs planted between tomato segments. Pretend to be posh and use your knife (hint: you can load more onto each chip that way too). The fried eggplant is stuffed with finely diced Chinese cabbage (wombok) and shitake mushrooms and enveloped in a golden caramel tinted, crisp, wispy, voluminous batter, much like the type used for fried taro dumplings at yum cha. Definitely a very welcome departure from over-interpreted tempura batter. The filling is moist but not too wet, with clean, fresh flavours. The vinegar and soy based ponzu sauce was well-balanced and made a good partner for the dish. A solid combination. 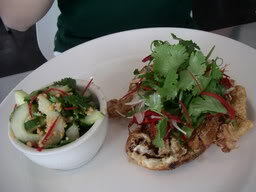 The fried egg with cucumber salad from the "bigger" section was another Asian-inspired dish bursting with freshness. 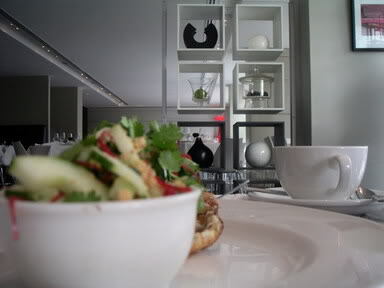 The nut relish in the cucumber salad is reminiscent of nuoc cham with a sprinkling of peanuts in Vietnamese cuisine. 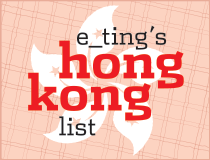 The egg is fried to a dramatic shape such that it stands atypically tall on the plate, and is loaded with parsley and threads of chilli and finished off with a sort of soy vinaigrette. We guessed that this was done in the deep-fryer, allowing the white to become browned whilst keeping the yolk addictively runny. Again, an interesting blend of flavours. If only there was some carb to mop all the liquids up! 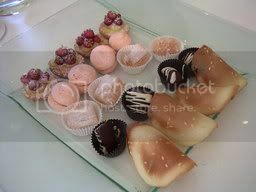 Desserts in the bar menu consist of small items such as lamingtons, Persian fairy floss and Turkish delights, but diners are also welcome to order more elaborate creations from the restaurant's dessert menu. 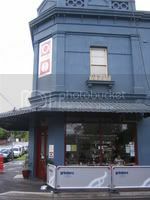 Asian diners may find that Pearl's menu shows creative use of seemingly everyday ingredients and techniques, therefore probably only the more adventurous amongst us would be inspired to visit the restaurant. Nonetheless, the bar would be a good place to get a feel for the food, or just for grabbing a good-value meal in a casual and groovy designer setting. It is often said that competition makes people work harder, to strive top be the top of the pack, or just to keep themselves from drowning. But the true winners are perhaps those who thrive continuously even without the threat of competition. Inside this Victorian cornerstore in the well-to-do eastern suburb of Hawthorn where private schools could well outnumber decent cafés could well be a humble milkbar, but (no offense to milkbar owners) I’m glad it’s Replete Providore instead. It’s late Saturday morning. Probably peak hour at this café/foodstore, but never had I imagined that there wouldn’t even be a single empty table. Luckily one of the lovely girls briskly cleared us a table that a couple of satisfied souls had just left. The café is not large, but immediately feels airy and bright thanks to the two large window panes on either side of the street corner. On one side, there’s a row of seats for those who like to gawk at the eastern-suburb folk walking or driving past, but their understatedly trendy outfits and humbly elegant cars may suddenly seem much less interesting compared to the rack of baked goodies from the renowned Philippa’s behind you, or the intriguing take home meals in the counter by your side. But no, it is highly unlikely that you’d walk out of here only good food only in your hands. Far more probably is that you’d have some (or too much) in your stomach too. Breakfast is the spotlight here and they range from cute (Coco Pops) to healthy (muesli, fruit and yoghurt) to indulgent (scrambled eggs with chorizo). My poached eggs with wilted spinach were suggested as a lighter, healthier alternative to eggs benedict, as the hollandaise sauce is optional, but how, possibly, could one resist the temptation of this wonderfully creamy egg yolk and butter sauce that has just the right amount of lemon juice to cut through the richness? Well, perhaps if I was forty years older, but not today and most of all, not here, where you can let your two thick slices of multigrain toast mop up all the gooey egg yolk from the two flawlessly poached eggs along with the sauce. In an attempt to reduce the guilt, there’s wilted spinach on the side, which was also cooked to perfection; it was really “wilted” and not boiled like it was the chef’s worst enemy. It would have been unbeatable but for the under-seasoning of the dish. The tomato bruschetta, a brilliant (again) slice of thick toast topped with top-class tomatoes tossed in sweetly fresh goat’s cheese, seemed unfortunately to have encountered the same under-seasoned fate. It may be for health reasons, or the fact that such fresh ingredients are tasty enough in the town right, but in my opinion, salt is an essential part of a dish, and a bit of it can do wonders on the tastebuds. This may just be that my tolerance of salt is higher than that of the general public, but I would have liked the opportunity to add extra salt into my dish; and the uninteresting matter that was contained in the salt and pepper shakers on the table virtually meant that I had no choice but to leave the (almost) immaculate dish alone. Coffees are very decent, incredibly smooth though a little weak, which is a peculiar common denominator of even the best suburban cafés. Also available are the usual suspects like tea and fresh juices. Replete doesn’t seem to need much competition to keep it at the top, but for the welfare of my fellow eastsiders, would it be awfully greedy to ask to boast a couple more café gems like this? I’ve been told that you need to be prepared to burn a mighty hole in your hip pocket if you want to dine with me. By going to Vue de Monde, our city’s finest French restaurant (according to this year’s The Age Good Food Guide), I only seem to be proving the point. But before you say “gotcha!”, let me explain that I went to Vue for their Lunch Menu. 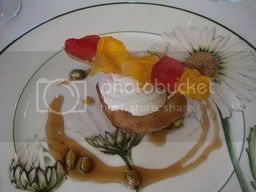 $26 for two courses and a glass of wine ($36 for three) at this year’s “Best French” is value for money par excellence. White tablecloths, sensible wine glasses, staff in ties and aprons, spells out loud and clear that this cozy corner in Carlton is a fine-diner, yet there are things that make it wonderfully down-to-earth, like the professional service, that’s at the same time fun and unpretentious, and what’s even more rare, “water” that can really be “just water”. Not that I personally mind the “still or sparkling” school of formal restaurants, but I was most impressed to see a restaurant of this quality and class being so flexible to suit all markets. The lunch menu comes in a leather file, with Menu Gourmand, Lunch Menu and à la carte options printed elegantly on translucent white paper slipped inside. Prime evidence that menus can be (and are, in fact) changed often, meaning it is reflective of seasonal availability of produce. I believe the document is much less heavy at dinner, when only the Menu Gourmand (a four to thirteen course degustation menu) is offered, and diners can discuss their preferences with staff and a suitable menu can be devised using timely produce. Many restaurants offer similar options, but not many dare to go as far as eliminating à la carte altogether. It would be most interesting (though also costly) to experience a fully-fledged showcase of this chef’s talents. Chef/owner Shannon Bennet is the lover-boy of the Melbourne restaurant scene. He’s young, good-looking, has published a book, pocketed a few awards, and did I mention he can cook? Nonetheless, wanting first only a taste of Vue, (and watching my student account) we stick to the Lunch Menu. My entrée is a pumpkin soup with prawns. 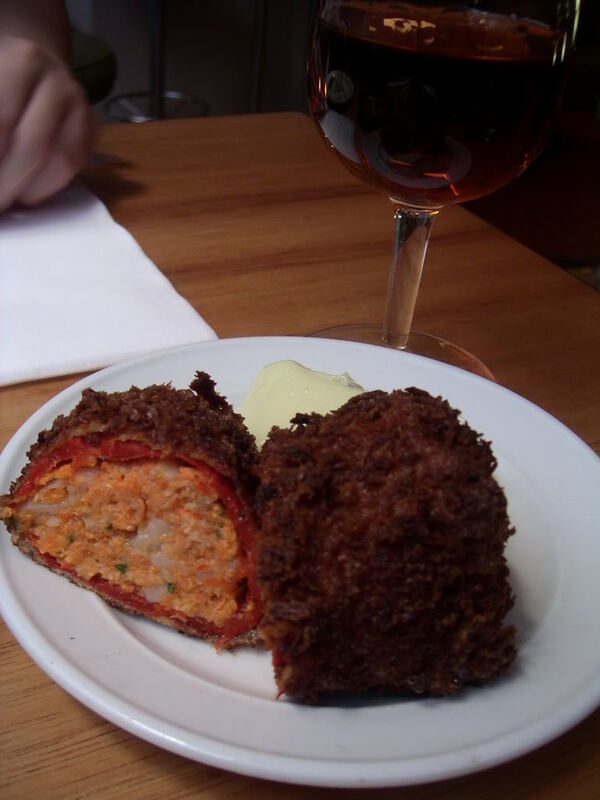 It is presented in the original vegetable, a dainty, golden, fist-sized version that is roasted and hollowed out, with two plump, lightly crumbed prawns resting gracefully on top. The consistency of the soup makes it quite filling, but is helped by the adequately small portion. It is also carries the distinctive flavour of cumin, and with the perfectly cooked prawns, add much depth and interest to a potentially everyday dish. In between, we are offered a palate-cleanser, a shot-glass of tomato consommé and tomato jelly, with a pastille-sized basil sorbet on the side. We are told to first place the basil sorbet onto our tongues, and let it melt a little before drinking the consommé. Both the flavours are tremendously precise and intense, yet it truly manages to cleanse and freshen the palate. Amusing indeed. 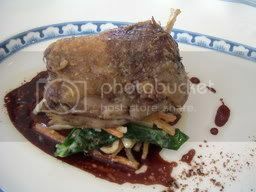 I choose the duck confit as my main. It is served on a quaint off-white oval dish with a blue border, much like something my imaginary grandmother who lives in the French countryside would own. Though I’m sure this grandmother would need a good pair of glasses and a steady hand to be able to produce a bed of julienned vegetables as fine as this one. They are cooked to give them just the right amount of ‘bite’ on the teeth, retaining their freshness, and are tossed lightly in cream to finish. This combination gives the warmth and comfort of a gratin, without the heaviness, yet satisfies my desire for clean garden flavours. Given present-day society’s fear of cream, it is uncommon nowadays to see vegetables cooked this way, but rest assured, the flourish of flavours and the smoothness that result are totally disproportionate to the amount of cream used. The duck confit itself, however, was not totally to my taste. There were no faults in the seasoning (the housemade five spice powder on the side was well-balanced), but the leg itself seemed a little dry, rendering it slightly stringy and tiresome in the mouth, although the flesh did fall off the bone easily. This comes as a surprise since confit, put simply, is meat treated with salt that is cooked and covered in fat (its own or otherwise usually of pork) and cellared, which, in my mind, should lead to a wonderfully tasty and moist meat. There is one dessert on the menu, which at first did not look very intriguing, but this warm halved peach with a vanilla ice cream swirl was a brilliantly refreshing end to the meal. Well, it wasn't the end yet, really. Upon ordering coffee, we were presented with five different kinds of petits fours that are well worth trying even if it means it’ll have your dentist screaming. Lunch at Vue de Monde means a heavy discount for us financially, but on the food and service end of the equation, they’re giving it 100%. The French grammar in their name is a bit off, (it should be ‘du’ rather than ‘de’), but who cares when their French food is this right. Not only does Miss Food Brat know her French, she also knows a fine deal when she tastes one, thank you very much. Melburnians are a trendy lot, in every respect – even food. Fashionistas at Fashion Week would have told you that tapas were “so last season”. True, the days when bars, cafés and restaurants on every other street claimed to serve tapas are over (thank goodness), but like trends in clothing, the true classics remain. Movida is one such classic. Tucked away in a narrow laneway lined with Vespas and motorcycles beside the Forum theatre, one could easily be led into thinking that they’d been transported to Madrid (bar the uniquely Melbourne graffiti that colours the walls on either side). And we haven’t even stepped into the bar yet. 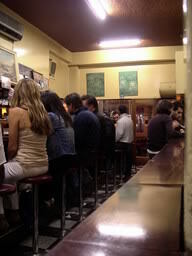 Inside this “bar de tapas y vino”, it’s surprisingly fresh, featuring lush greens and wood against clean cream walls. It’s a hard-to-describe feeling; comfortably chic is the best I can do. The warm lighting, partially attributed by the natural light, and the cut flowers complete the package nicely. There are seats at the bar and high benches for those who just want a drink and some tapas, and tables in the main dining area for more substantial dishes, which are written on the walls that also act as blackboards. Drinks shouldn’t be missed here - firstly because they have a diverse and interesting wine list with drops from Australia, New Zealand and other European countries (including Spain, of course), and secondly because having tapas without a drink is like wearing a trench coat without a belt. It needn’t be a strong drink, though you may like to leave the car at home because they have an intriguing selection of Spanish sherries (all available by the glass) which would go well with the tapas. The brisk and friendly service people would be more than happy to explain them to you. I chose the lovely Emilio Lustau 'Escuadrilla' Amontillado, a sweeter variety, which was nutty both on the palate and the nose, and worked in a pleasant (i have my reservations when it comes to the word 'perfect') harmony with all our dishes, including dessert (more on that later). The tapas menu has two sections – tapa and racio. The former comes as single portions (for example, one lamb cutlet, one zucchini flower) whereas the latter are slightly larger sharing plates. That, I guess, is the beauty of tapas – ideal for indecisive people like me who want to try a bit of pretty much everything. First came the ensalada valenciana, an endive salad with palm hearts, olives, and orange segments. Beautiful, particularly the marinated palm hearts. Then there was the piemiento de piquillo, a smoked baby red pepper stuffed with meat from blue swimmer crab and potato which was breadcrumbed and deep-fried. The crumb was a little too dark; two seconds less in the deep fryer would have been fine by me, but it was nonetheless crunchy and flavoursome. The pepper and crabmeat combined to a sweetness only fresh ingredients could emit. Speaking of sweetness, that of the flor de calabacin, a zucchini flower stuffed with goats’ cheese, was no less than delectable. The baby zucchini on the end was the most gratifying I’d ever had; and coupled with the goats’ cheese, just shows how little you have to do to create formidable dishes when you have excellent ingredients. The tortilla de patatas, a frittata-like omelette of confit potatoes and onion was much less exciting on the flavour front, though it serves as a good carb/protein dish to kick off a night of sherries and cider. It may be hard to imagine having tapas for dessert as well, but let the guys at Movida inspire your imagination with churros (also on a blackboard-wall). This is series of sugar and cinnamon-dusted Spanish donuts in stick form, served with a cup of lusciously rich hot chocolate. Some places serve molten chocolate instead of hot chocolate for dipping the donuts into and offer a small jug of warm milk on the side to add to the remainder of the molten chocolate. Both methods are just as good – this hot chocolate is rich and thick enough to coat the churros, yet fluid enough to drink afterward. The drink is very warming, the kind that I wish I could have near home on a cold, grey winter’s morning. Whether it be after work drinks, a rendezvous with the girlfriends, or a pre-theatre dinner, this is the place to stop by. The tapas menu and wine list are very reasonably priced – I’m compelled to try their mains one evening, but I might have to put a couple of new fashion purchases on hold. Morning-itis. An illness no doubt familiar to many. There are many good cures for this, but putting two sufferers together definitely isn’t one. Many a time have I been greeted with a grunt or just plain bad attitude when trying to obtain my preferred morning-itis cure – a half-decent coffee. Hence the immense surprise as I entered Elizabeth Street Espresso where I was actually greeted warmly at 7.45am by a counterperson who was obviously much wider awake than I was. It doesn’t take much to make one’s day – a warm smile, a “how are you?” like they genuinely want to know how I am after surviving the horrific morning carpark (I think they call it a freeway). At this veritable hole-in-the-wall shop, the surprises just keep coming. The two lovely service people share their workspace, which seems no larger than a few square meters, with a commercial toaster and a huge fridge, among other things, and yet manage to keep service swift and warm. How they manage to serve excellent coffee and dish out their impressive variety of paninis at lunchtime and squeeze you orange juice to order is beyond me. Pure magic. Ignoring the small number of seats at the front, this shop is really not much more than a counter. Most of the countertop is dominated by the all-important coffee machine and the cashier. What remains of the counter space is filled with sweet indulgences – flaky Greek baklavas, jam-filled donuts, Portuguese egg tarts (Mondays, Wednesdays and Fridays only) – and baked goodies suitable for a light breakfast, such as bagels and muffins. Service is absolutely top-class. My request for a bagel was responded promptly by a question – whether I wanted it toasted and buttered. At that hour, it didn’t even occur to me that bagels could be toasted. My takeaway bagel came in a paper bag with a sturdy serviette that would put some “restaurants” to shame. Talk about an eye for detail. Another surprise was the Illy brand – a brand of quality coffee not commonly seen in Melbourne, but quite popular everywhere else, which is interesting, considering our city’s obsession with coffee. Like some other brands that we are accustomed to, Illy only uses 100% Arabica beans, but the end product here is much less strong, and there is a peculiar sweetness in the coffee – something that I have personally never tasted before. The barista at Elizabeth Street Espresso is no amateur. In the coffee world, I’d only be in kindergarten, but I do know that apart from the quality of the beans themselves, a good barista is vital to the coffee-making process, as it is s/he who controls the temperatures, times, pressures, and other factors that distinguish the good coffees from the not-so-good. These people are serious about their coffees. They only offer one size, in order to ‘preserve quality’, as a sign clearly displays. Illy beans are also available for sale. 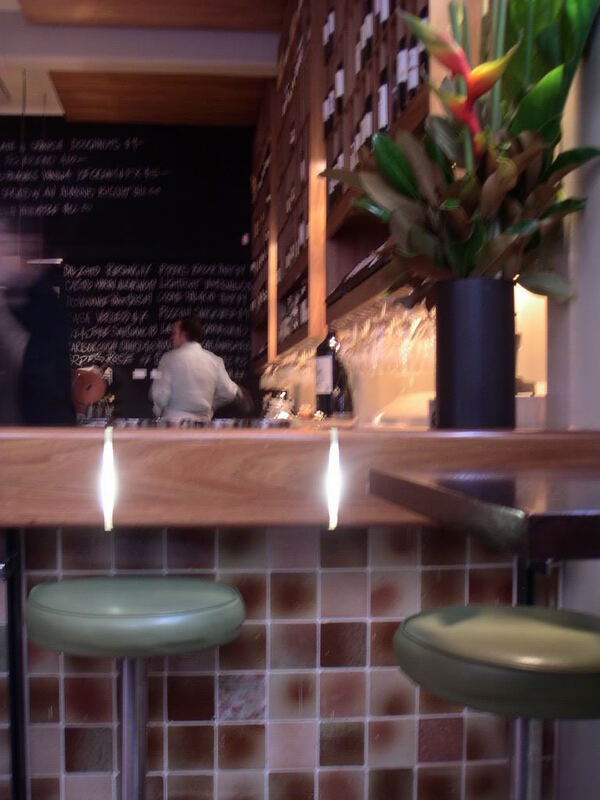 If you must, there are a small number of tables to sit down at in front of the counter. To put your mind off the fact that it feels like you’re sitting in the middle of a damp bank foyer, there are newspapers, including the Financial Times, for all those commercial world high-fliers. With it’s impeccable service and more than acceptable coffees and food, the sleepyhead in me is most grateful to have awakened to one of the City’s little gems.